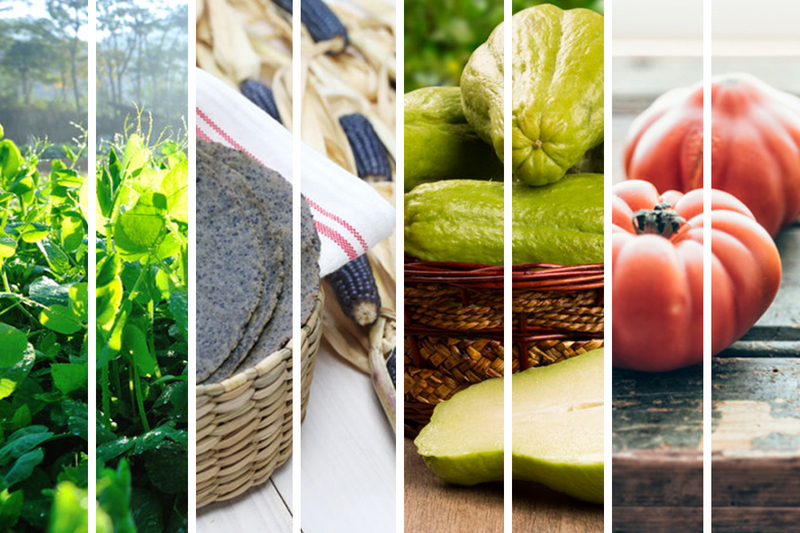 Pack your taste buds and follow us on a culinary journey from South America to Asia with this month’s spotlight ingredients! Fun fact: in contradiction with their name, snow pea tips don’t actually refer to the tips of the pods but rather, the leafy growth near the pods. Now that’s out of the way, let us tell you about these tasty Asian greens. Snow pea tips and stir-fry are like two peas in a pod – easy to cook (thanks to edible leaves and stalks) they make a soft yet resilient bite. Sit back, relax and picture a better tasting, gluten-free, tortilla. Wait a minute… is that even possible? Feast your eyes on the blue corn tortilla! A true pillar of traditional Southern and Central Mexican cuisine, blue corn is a top-shelf ingredient guaranteed to open up your tortilla horizons. You say tomato, we say heirloom tomato! Filled with flavour, heirlooms seeds are free from human manipulation – no doubt experts say the heirloom is the closest thing to a “true tomato”. To top it all off, they come in a palette of bright colours that will light up your kitchen. Still not convinced? We bet the first bite will change your mind! See what recipes they’re featured in on the menu!